Confirmation emails will be sent to the email address provided when your order is received, when payment is confirmed and again when your ketubah is shipped. Shipping and tracking information will be provided so that you can follow the progress of your vows art as it makes its way to you. Orders ship via USPS Priority Mail, FedEx Ground or UPS Ground and include tracking/delivery confirmation and appropriate insurance. International orders are shipped USPS, FedEx Ground or UPS Ground. Please allow an extra 5 business days for shipping times in addition to order and production time. Through Paypal, we accept MasterCard, Visa, American Express, Discover Card and Electronic payment via Bank Authorization. How long will it take for me to receive my ketubah? The complete process from order to delivery can vary depending on your format choice (3D framed ketubah vs. matted or flat ketubah print). A good rule of thumb is to allow 6 weeks for 3D framed ketubahs and 4 weeks for matted or flat ketubah prints. 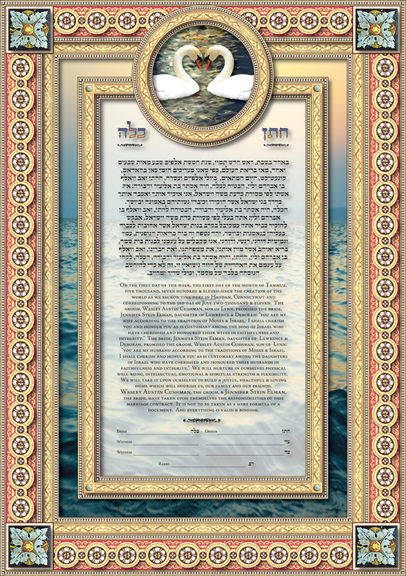 For deadlines between 3 weeks and 7 days from the wedding date, please contact me and I will work with you to get your ketubah to you in time. (Rush charges may apply). Unfortunately, there are no returns on personalized ketubahs. please contact me directly with any additional questions related to shipping your order: click on "contact us"